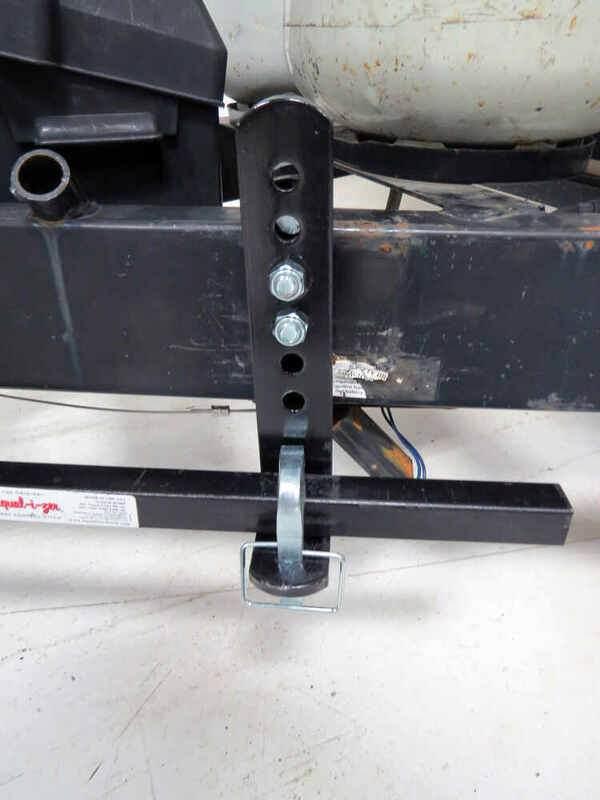 Steel-on-steel friction works to prevent and correct trailer sway in this unique weight distribution system. 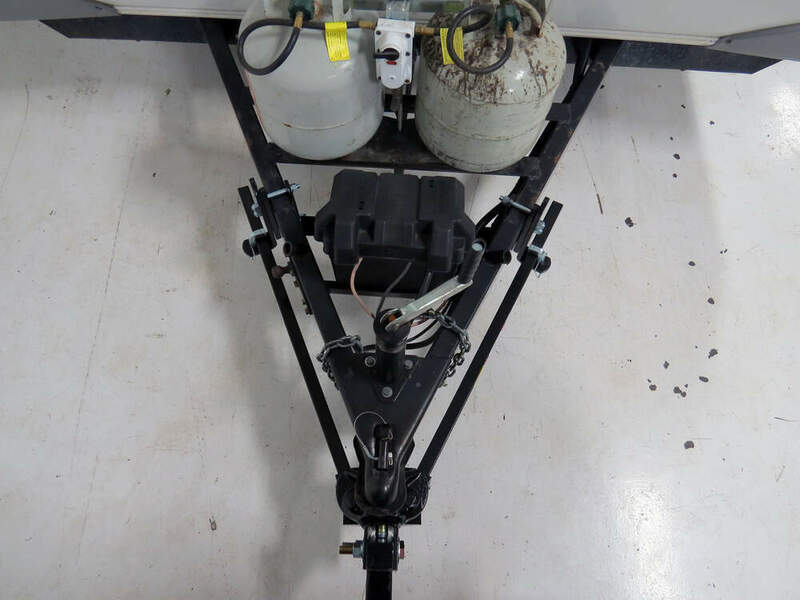 Sway control brackets ensure that your trailer stays in line with your tow vehicle. 2" Hitch ball and adjustable shank included. Lowest Prices for the best weight distribution from Equal-i-zer. Equal-i-zer Weight Distribution System w/ 4-Point Sway Control - 6,000 lbs GTW, 600 lbs TW part number EQ37060ET can be ordered online at etrailer.com or call 800-298-8924 for expert service. 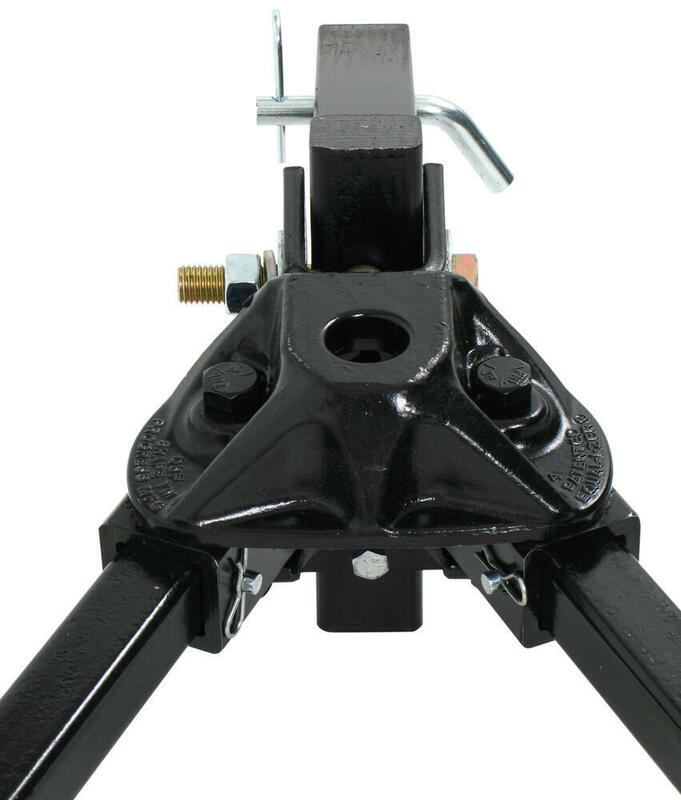 Maximum trailer frame height: 6"
Total height adjustment along shank: 7-1/2"
Create a more stable ride for your tow vehicle and trailer with a weight distribution hitch. 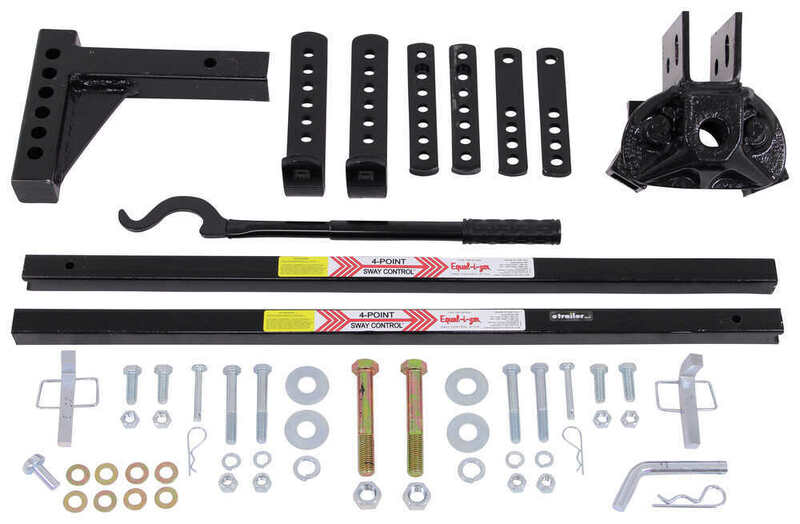 Adding spring bars to your towing system applies leverage, which transfers the load that is pushing down on the rear of your vehicle to all the axles on both your tow vehicle and your trailer, resulting in an even distribution of weight throughout. 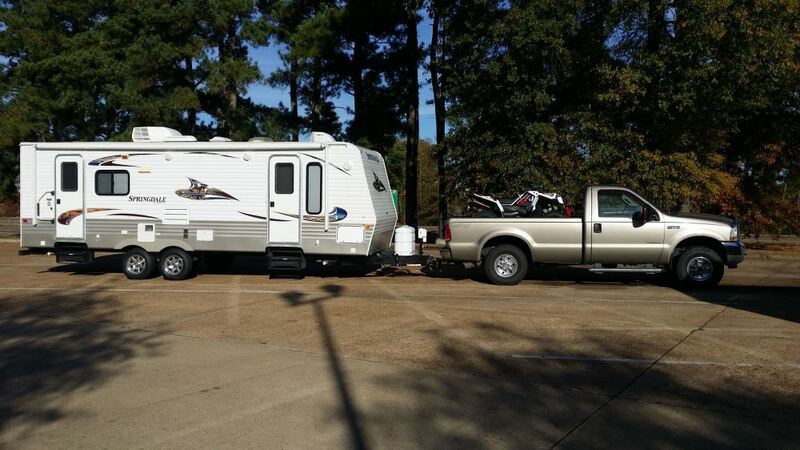 The result is a smooth, level ride, as well as the ability to tow the maximum capacity of your hitch. The Equal-i-zer weight distribution system uses the traditional washer-style adjustment method to achieve the perfect tilt. Controlling the head tilt helps you to fine-tune the leverage on your entire system, making it easier to install and hook up the spring bars. To adjust the tilt, simply slide washers onto the spacer rivet and insert the rivet into the head assembly. To increase the angle, add a washer. To reduce the angle, remove a washer. Most setups take four to six washers to achieve the proper height. Once you get the desired tilt, insert the shank bolts to secure the head to the shank and then tighten it in place. The Equal-i-zer spring bars are not made of traditional spring steel. Rather, they are constructed of a chromium-molybdenum alloy steel. Chromoly steel has a high tensile strength for extreme durability. It also features excellent dexterity, which allows it to give as required and then return softly back to its original form. This pliability is important in minimizing trailer bounce while still ensuring that the weight of your rig is adequately distributed. The unique sway control brackets of the Equal-i-zer are easy to install and simple to use. 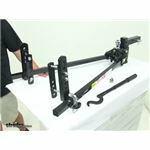 They clamp onto your trailer frame and conveniently adjust to a position anywhere between 27 inches and 32 inches back from the coupler. These brackets provide the attachment points for the weight distribution spring bars. To position the spring bars during hookup, simply use the included snap-up lever to lift each bar into place on the L-shaped brackets. Then secure the bars in place with the included L-pins and clips. The Equal-i-zer weight distribution system works to stop trailer sway before it begins. This is achieved through the rotational friction that is present in the weight distribution hitch itself. 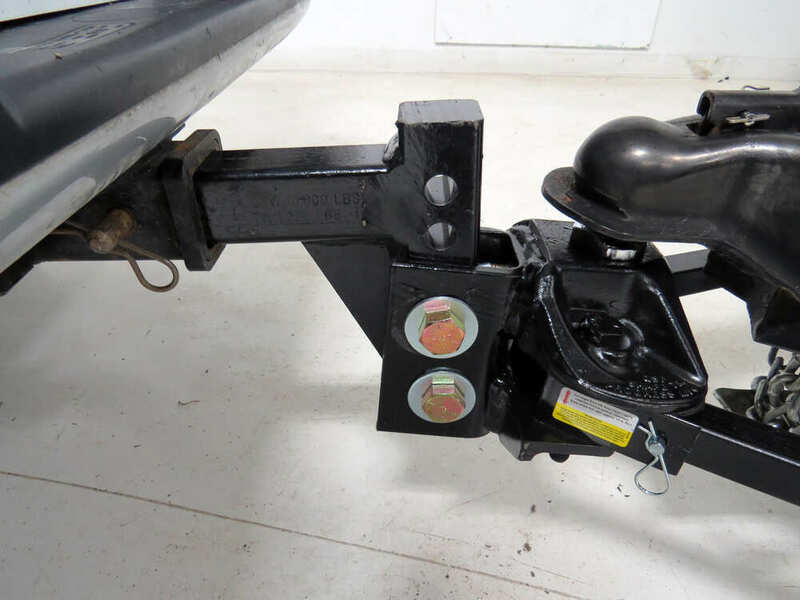 Within the system head, the downward pressure that is placed on the hitch ball by the trailer is combatted by the upward pressure exerted by the spring bars that are mounted in the sockets. 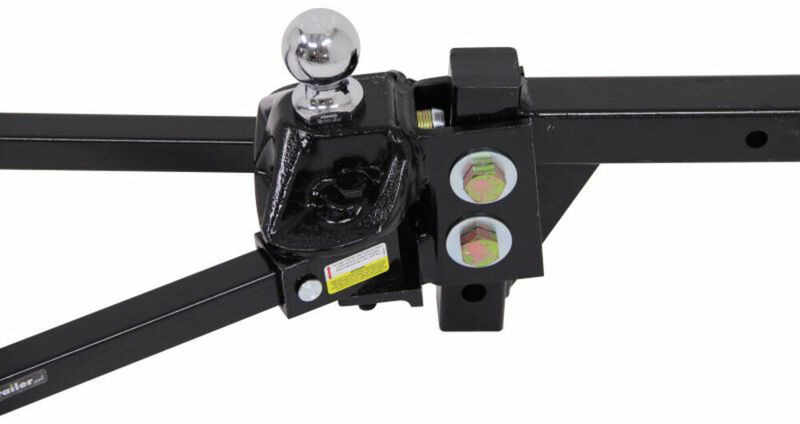 This upward force is placed on the spring bars on either side of the system, creating the rotational friction that, essentially, forces your trailer in line. This type of friction is responsible for two points - one on either side of the trailer - of the 4-Point Sway Control. To ensure that enough tension is present, make certain that the socket bolts in the head assembly are torqued to at least 45 foot-pounds. 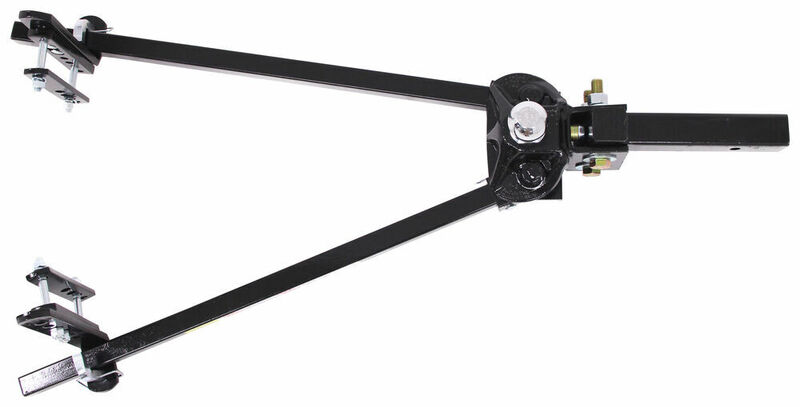 The other two points of sway control are created by the steel-on-steel friction that occurs when the spring bars slide within the L-brackets that are mounted on the trailer tongue. Most traditional weight distribution systems have spring bars that are suspended by chains. Although this ensures that the system is not so rigid as to create bounce in the trailer, it also allows a good deal of side-to-side play in the system. Letting the spring bars hang freely minimizes the rotational friction described earlier. 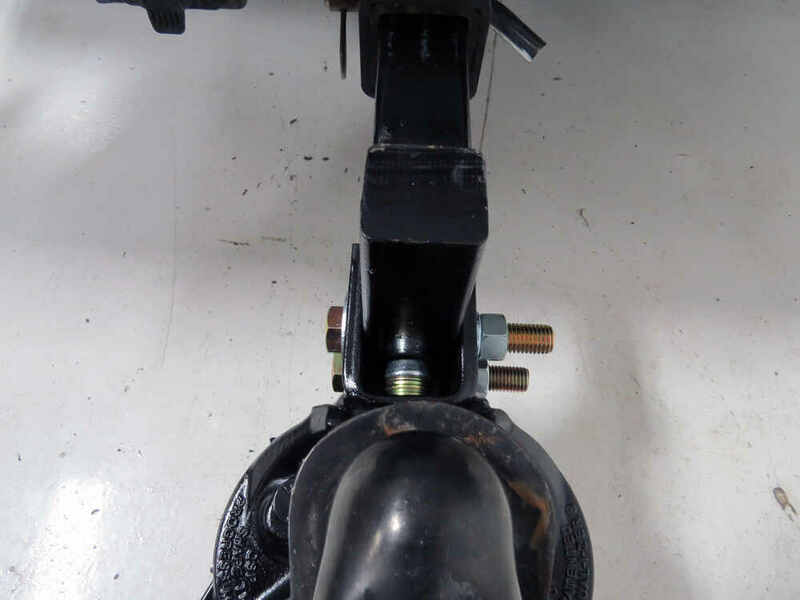 It also eliminates your system's ability to create the type of direct friction that has been shown to be so effective in limiting trailer sway. This direct friction that is applied to the spring bars in the Equal-i-zer system helps to stop sway once it has begun. The concept is similar to the way in which an add-on friction sway control device functions. When each spring bar moves forward or backward, or side to side, it rubs along the bracket, creating friction. The resistance created by this action limits the movement of the spring bar, thus preventing further side-to-side movement of the trailer. Most add-on units feature some sort of friction material similar to that used in automotive brakes. But the Equal-i-zer uses direct steel-on-steel contact to create resistance. This is the same sort of friction that is used with locomotives that pull loaded railcars weighing tons. No additional materials are needed. The steel will outlast any of those other materials, providing an extremely durable, functional sway control system. 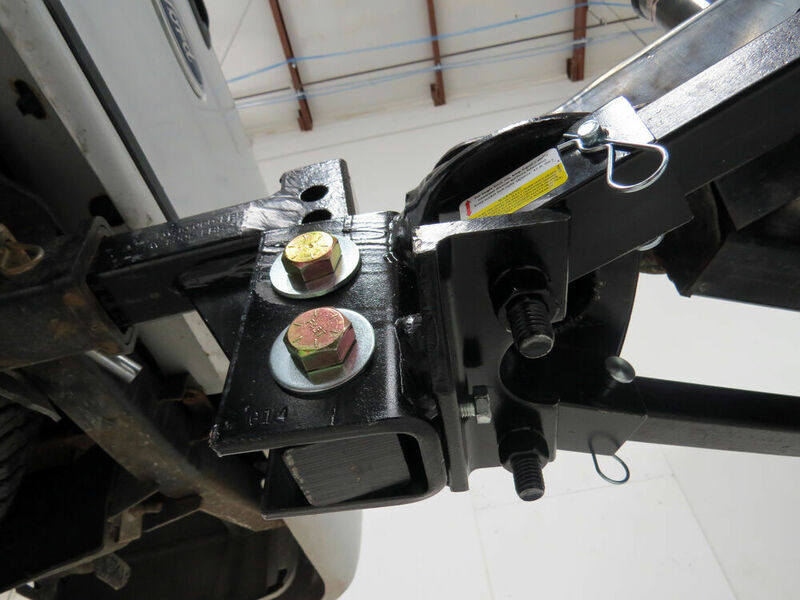 Steel-on-steel friction works to prevent and correct trailer sway in this unique weight distribution system. 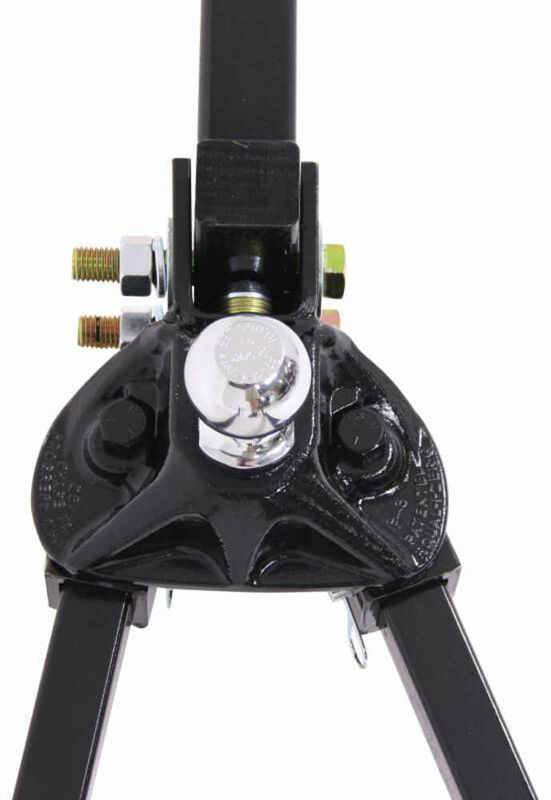 Sway control brackets ensure that your trailer stays in line with your tow vehicle. 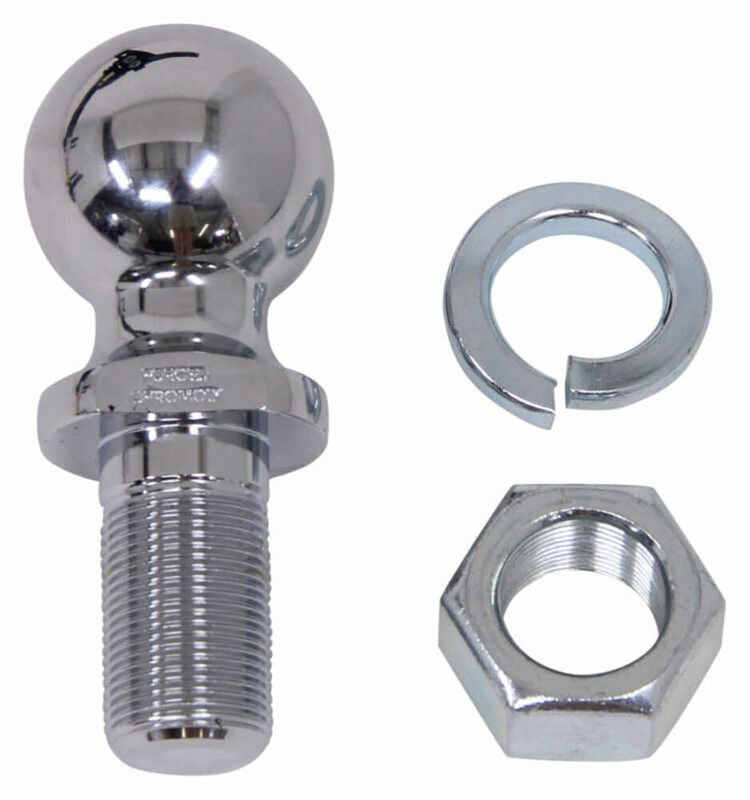 2-5/16" Hitch ball and adjustable shank included. Speaker 1: Today we're taking a look at the equalizer weight distribution system with four point sway control. 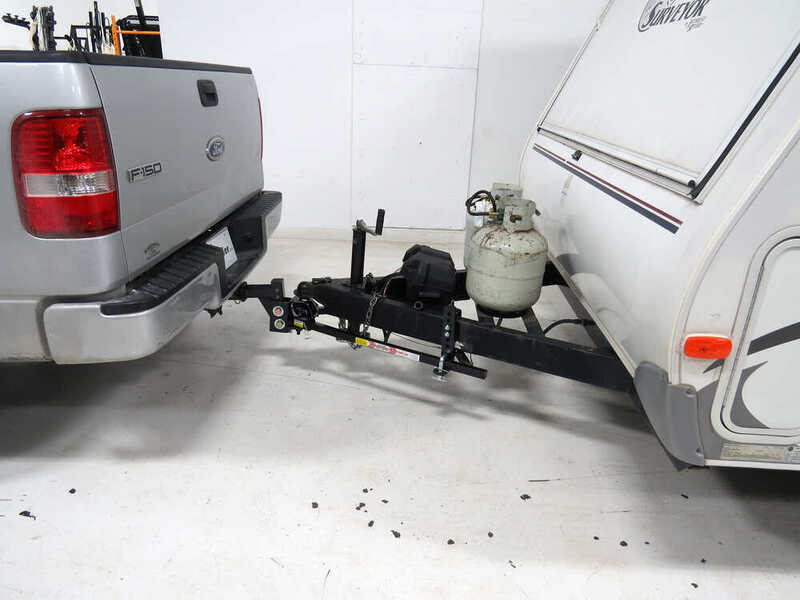 A weight distribution system creates a more stable ride for your tow vehicle and your trailer. This unit features a two inch hitch ball, which is included. 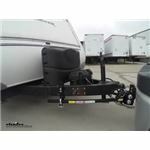 It has a gross towing weight capacity of up to 6,000 pounds, and it is designed for trailers that have a ton of weight between 200 and 600 pounds.It fits inside of a two inch by two inch trailer hitch receiver secures in place with the included pin and clip, and again it fits inside a two inch by two inch trailer hitch, but you need to make sure that your hitch is rated for use with a weight distribution system.Now adding spring bars or weight distribution system to your towing setup really helps apply leverage, and the reason why that's important is because leverage transfers the load that is pushing down on the rear of your vehicle to all the axles on both your tow vehicle and your trailer. What that does is it results in an even distribution of weight throughout your towing setup. 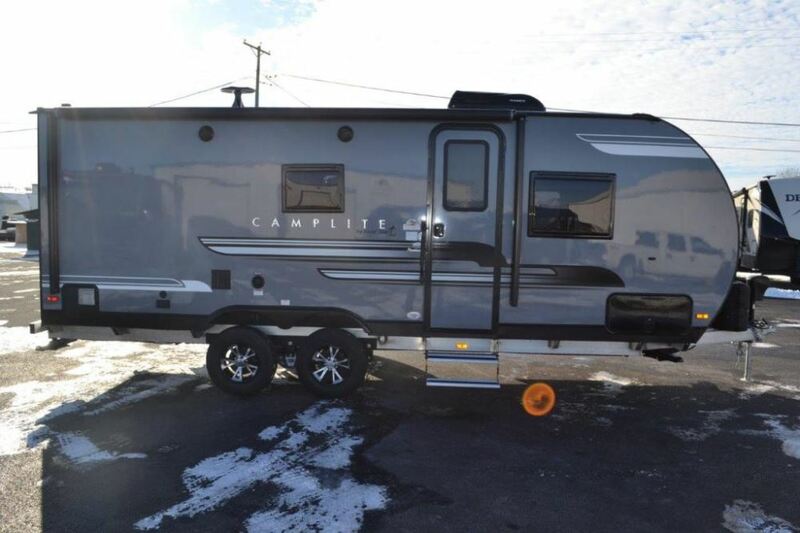 Which results in a smooth ride, a more level ride, and it has the ability to tow the maximum capacity of your hitch.Now this unit does feature integrated four point sway control, which works to stop trailer sway before it begins, and it's integrated. Like I said, there's no additional sway control systems that need to be added onto correct trailer sway. It's all integrated, so the head right here, this is the weight distribution head. This creates two points of sway control using what's known as rotational friction. Downward pressure placed on the hitch ball fights the upward pressure created by the spring bars. 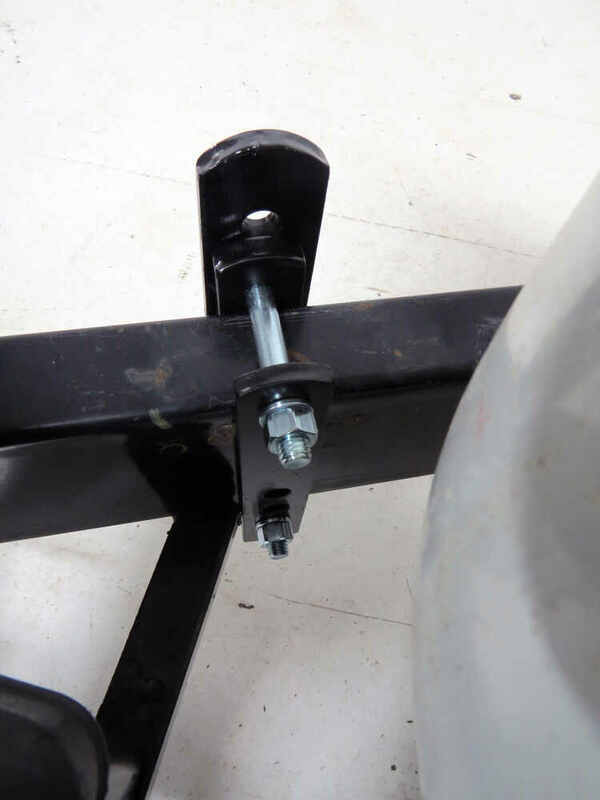 The upward force is placed on the spring bars on both sides of the system, which creates the rotational friction that forces to keep your trailer in line all the time.The other two points of sway control are created by the steel on steel friction that occurs when the spring bars slide within the L brackets that are mounted on the trailer tongue. Now, the unique design makes the system compatible with surge type brake actuators. The spring bars are designed to flex for a controlled even ride. One of my favorite features about this system is that this is not just standard steel when it comes to the spring bars. These are made of a specialized steel to offer superior dexterity and spring and the playability is important because that really helps drastically minimized trailer bounce. Also, it has the no drill clamp on brackets. These can be adjusted along your trailer frame, which was really nice. They're a nice basically low profile design. They don't take up much space to the side or above your trailer frame, so that really helps accommodate frame mounted items such as gas tanks, battery boxes, tool boxes, generators and so on.Then another thing when you're comparing weight distribution systems is really how the head assembly tilts. This one uses the traditional washer and spacer rivet design, so you can add or remove washers from the spacer rivet to tilt the head up or down, and fine tune the leverage on your entire system. That spacer Rivet installs between the shank right here and the slot right here of the head assembly. Also, on the bottom we have a set bolt that we can tighten to help take out any play from the head assembly attachment to the adjustable shank right here.When it comes to protecting the unit from the elements and rusting corrosion, you don't have to worry about what that system. This unit uses a dipped steel, so that's very durable. It's also rust and corrosion resistant. Comes with the snap up lever. 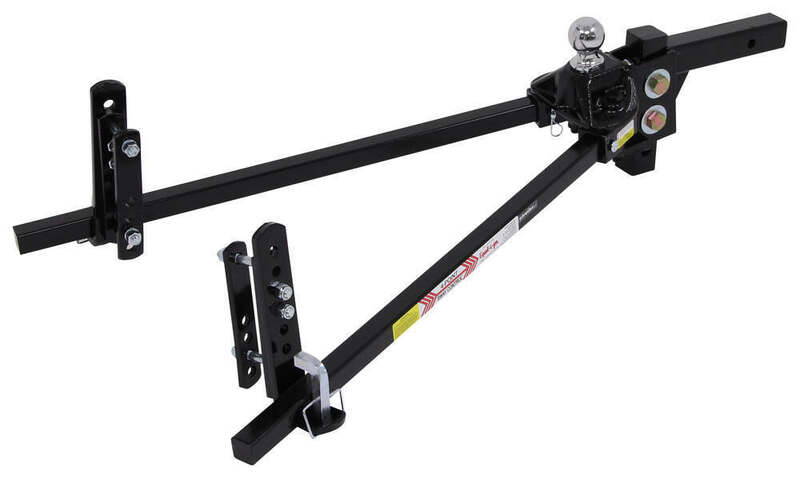 This eases installation of the spring bars by reducing the amount of lifting required by the trailer jack. The product's made in the USA. Your sway control brackets need to be positioned 27 to 32 inches back from the center of your coupler. The maximum trailer frame heights and this will accommodate or fit on is six inches tall. As you can see, we have multiple holes on the bracket, so it is designed to set most trailer frames out there on the market, but again, maximum trailer frame height is six inches.Last thing I want to mention is the shank length. We took some measurements on that and we measure from the center of the hitch pin hole on that shank to the center of the adjustment holes and got a measurement of around eight inches. So to the front we get nine inches to the back of that upright bar, we get like seven inches, and the overall length of that shank is 12 inches. This unit offers a total height adjustment along the shank of seven and a half inches. You can use this in the drop or rise positions with it in the maximum, or excuse me with it in the rise position at the highest setting.You're going to get a maximum rise of around seven inches. That's from the inside top edge of the receiver tube of your hitch to the top of the ball platform. With it in the drop position at the lowest setting, you're going to get a maximum drop of three inches, and then your holes are spaced apart on center by an inch and a quarter. So that's your incremental height adjustment. Again, the product's made in the USA and it's covered with a limited lifetime warranty. That's gonna do it for today's look at the equalizer weight distribution system with the integrated four point sway control. Order: RelevanceNewestRating - High to LowRating - Low to High Steel-on-steel friction works to prevent and correct trailer sway in this unique weight distribution system. 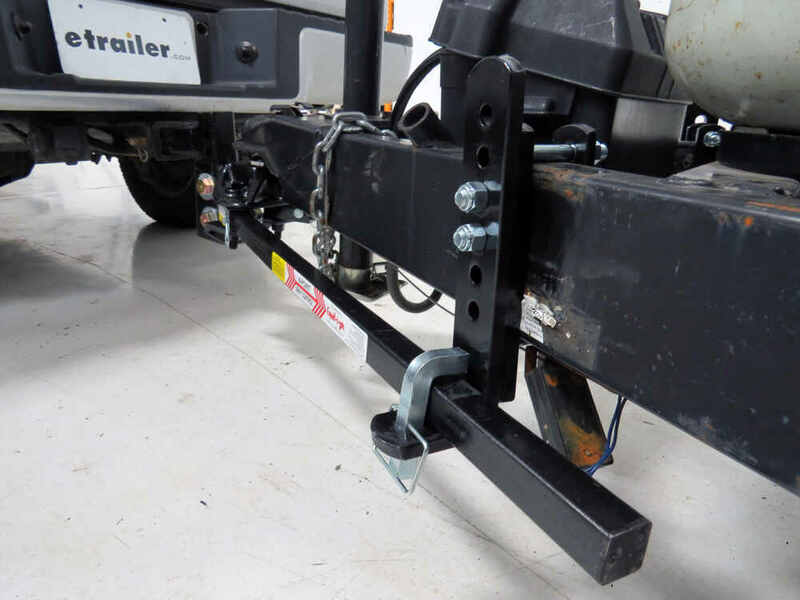 Sway control brackets ensure that your trailer stays in line with your tow vehicle. 2" Hitch ball and adjustable shank included. I have loved your hitches since 1995. We pulled a camper for 10 years without one and basically started avoiding the interstate highways because of what happened when trucks passed us. The guy at the place we stored our camper had a used Equilizer that we bought and used for 12 years. We got a new tow vehicle with a higher hitch and the old Equilizer was welded and could not be adjusted. Thats when we bought the new one. I watch people at the campgrounds wrestling with other hitches and I just calmly hook mine up and go. I hardly feel the camper behind us. You have a great product and I will use it till I cant camp any more. After 1 year and many trips, no problems with the Equalizer hitch. Works great. Easy to set up. A bit heavy to carry. 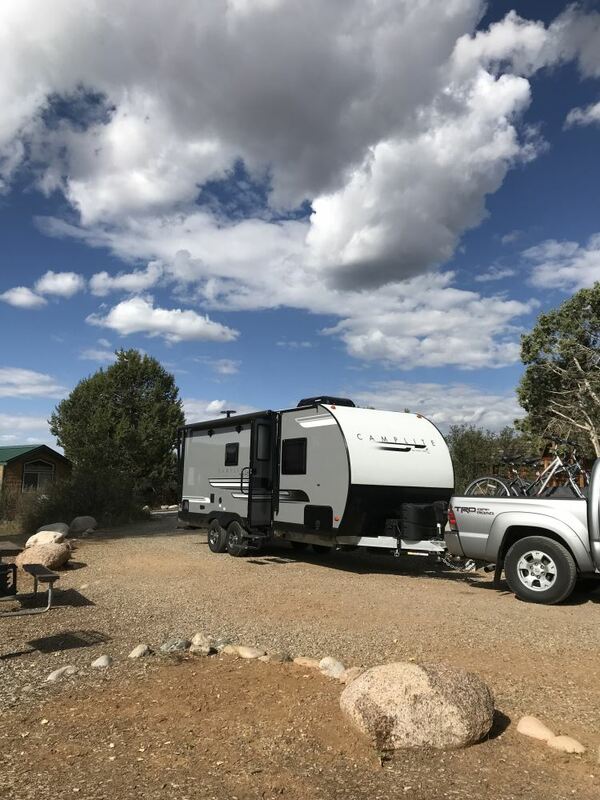 Installation went well and we have been towing our rv since with no problems at all. I have had no sway at all with the hitch. Its been over a year since I purchased my Equalizer hitch system and I am completely satisfied with it. Occasionally I have to spray some lubricant on the pivot points on the receiver end to keep the noise down but other than that It works as advertised and I would again rate it 5 stars. Great! Best hitch I’ve used. Can a Unibody Vehicle Use Weight Distribution or Sway Control? Weight distribution hitches are designed to be able to move up and down because you are going to run into situations like this everywhere you go. So no worries about it stressing the system. The back of the trailer is less likely to make contact with the ground if you come in at an angle. You can also mount some skid wheels, see link, and the rear, bottom of the trailer to avoid scraping anything on the underside of the trailer.